A key requirement of any realtime operating system is high-performance character I/O. Character devices can be described as devices to which I/O consists of a sequence of bytes transferred serially, as opposed to block-oriented devices (e.g. disk drives). Programs access character devices using the standard open(), close(), read(), and write() API functions. Additional functions are available for manipulating other aspects of the character device, such as baud rate, parity, flow control, etc. Since it's common to run multiple character devices, they have been designed as a family of drivers and a library called io-char to maximize code reuse. The io-char module is implemented as a library. As shown in this diagram, io-char is implemented as a library. The io-char module contains all the code to support POSIX semantics on the device. It also contains a significant amount of code to implement character I/O features beyond POSIX but desirable in a realtime system. Since this code is in the common library, all drivers inherit these capabilities. The driver is the executing process that calls into the library. In operation, the driver starts first and invokes io-char. The drivers themselves are just like any other QNX Neutrino process and can run at different priorities according to the nature of the hardware being controlled and the client's requesting service. Once a single character device is running, the memory cost of adding additional devices is minimal, since only the code to implement the new driver structure would be new. The io-char library manages the flow of data between an application and the device driver. 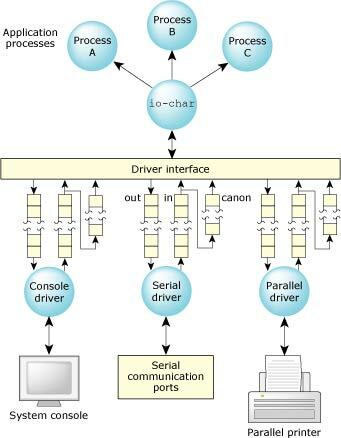 Data flows between io-char and the driver through a set of memory queues associated with each character device. Three queues are used for each device. Each queue is implemented using a first-in, first-out (FIFO) mechanism. Device I/O in QNX Neutrino. Interrupt handlers within drivers typically call a trusted library routine within io-char to add data to this queue — this ensures a consistent input discipline and minimizes the responsibility of the driver (and effort required to create new drivers). The io-char module places output data into the output queue to be consumed by the driver as characters are physically transmitted to the device. The module calls a trusted routine within the driver each time new data is added so it can “kick” the driver into operation (in the event that it was idle). Since output queues are used, io-char implements write-behind for all character devices. Only when the output buffers are full will io-char cause a process to block while writing. The canonical queue is managed entirely by io-char and is used while processing input data in edited mode. The size of this queue determines the maximum edited input line that can be processed for a particular device. The sizes of these queues are configurable using command-line options. Default values are usually more than adequate to handle most hardware configurations, but you can “tune” these to reduce overall system memory requirements, to accommodate unusual hardware situations, or to handle unique protocol requirements. Device drivers simply add received data to the raw input queue or consume and transmit data from the output queue. The io-char module decides when (and if) output transmission is to be suspended, how (and if) received data is echoed, etc. Get ID of process group leader for a terminal. Set ID of process group leader for a terminal. Suspend or restart data transmission/reception. Initiate a disconnect. For a serial device, this will pulse the DTR line. Inject characters into the canonical buffer. 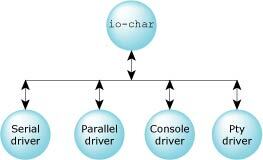 The io-char module acts directly on a common set of devctl() commands supported by most drivers. Applications send device-specific devctl() commands through io-char to the drivers. Conditions for satisfying an input request. Any protocol that knows the character count for a frame of data it expects to receive can use TIMEOUT. This in combination with the baud rate allows a reasonable guess to be made when data should be available. It acts as a deadman timer to detect dropped characters. It can also be used in interactive programs with user input to timeout a read if no response is available within a given time. TIMEOUT is a QNX extension and is not part of the POSIX standard. FORWARD is a QNX extension and is not part of the POSIX standard. The ability to “push” the processing for application notification into the service-providing components of the OS reduces the frequency with which user-level processing must occur. This minimizes the IPC work to be done in the system and frees CPU cycles for application processing. In addition, if the application implementing the protocol is executing on a different network node than the communications port, the number of network transactions is also minimized. In edited mode, io-char performs line-editing operations on each received character. Only when a line is “completely entered” — typically when a carriage return (CR) is received — will the line of data be made available to application processes. This mode of operation is often referred to as canonical or sometimes “cooked” mode. When the driver runs, code in io-char will examine the character and apply it to the canonical buffer in which it's building a line. 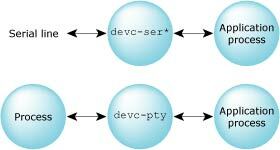 When a line is complete and an application requests input, the line will be transferred from the canonical buffer to the application — the transfer is direct from the canonical buffer to the application buffer without any intervening copies. Interrupt handlers place received data directly into a memory queue. Only when a read operation is pending, and that read operation can be satisfied, will the interrupt handler schedule the driver to run. In all other cases, the interrupt simply returns. Moreover, if io-char is already running, no scheduling takes place, since the availability of data will be noticed without further notification. When a read operation is satisfied, the driver replies to the application process directly from the raw input buffer into the application's receive buffer. The net result is that the data is copied only once. These rules — coupled with the extremely small interrupt and scheduling latencies inherent within the OS — result in a very lean input model that provides POSIX conformance together with extensions suitable to the realtime requirements of protocol implementations. System consoles (with VGA-compatible graphics chips in text mode) are managed by the devc-con or devc-con-hid driver. The video display card/screen and the system keyboard are collectively referred to as the physical console. The devc-con permits multiple sessions to be run concurrently on a physical console by means of virtual consoles. The devc-con console driver process typically manages more than one set of I/O queues to io-char, which are made available to user processes as a set of character devices with names like /dev/con1, /dev/con2, etc. From the application's point of view, there “really are” multiple consoles available to be used. Of course, there's only one physical console (screen and keyboard), so only one of these virtual consoles is actually displayed at any one time. The keyboard is “attached” to whichever virtual console is currently visible. The console drivers emulate an ANSI terminal. When devc-ser* is started, command-line arguments can specify which — and how many — serial ports are installed. On a PC-compatible system, this will typically be the two standard serial ports often referred to as com1 and com2. The devc-ser* driver directly supports most nonintelligent multiport serial cards. QNX Neutrino includes various serial drivers (e.g. devc-ser8250, devc-serppc800, etc.). For details, see the devc-ser* entries in Utilities Reference . Parallel printer ports are managed by the devc-par driver. When devc-par is started, command-line arguments can specify which parallel port is installed. The devc-par driver is an output-only driver, so it has no raw input or canonical input queues. The size of the output buffer can be configured with a command-line argument. If configured to a large size, this creates the effect of a software print buffer. Pseudo terminals are managed by the devc-pty driver. Command-line arguments to devc-pty specify the number of pseudo terminals to create. A pseudo terminal (pty) is a pair of character devices: a master device and a slave device. The slave device provides an interface identical to that of a tty device as defined by POSIX. However, while other tty devices represent hardware devices, the slave device instead has another process manipulating it through the master half of the pseudo terminal. That is, anything written on the master device is given to the slave device as input; anything written on the slave device is presented as input to the master device. As a result, pseudo-ttys can be used to connect processes that would otherwise expect to be communicating with a character device. Ptys are routinely used to create pseudo-terminal interfaces for programs like pterm, a terminal emulator that runs under the Photon microGUI and telnet, which uses TCP/IP to provide a terminal session to a remote system.